In the wild, geckos usually shed without difficulty. Adapted to the humidity of their local habitats, their skin peels off easily and completely. If your husbandry does not mimic the natural habitat of your pet, he may experience shedding problems. Called dysecdysis, the condition causes your gecko to retain portions of his skin. While relatively easy to remedy, it is important to correct your husbandry practices to avoid the problem in the future. Periodically, your gecko must shed the outermost layer of his skin to allow for growth and the replacement of damaged skin. If the process goes well, the skin will slough off in several large pieces; however, if stressed, dehydrated or parasitized, he may retain large portions of his skin. While dysecdysis is not a medical emergency, serious consequences are possible if the retained skin is near his eyes or constricts the blood flow to his toes or tail. Once your gecko is finished shedding, he will usually eat his old skin to avoid wasting any nutrients. Treating dysecdysis is relatively easy. Begin by placing your gecko in a small, plastic container with a few damp paper towels or sphagnum moss for 15 to 30 minutes. The increased humidity in the container will help to loosen the retained skin, which may come off without further effort on your part. If your lizard is handleable, gently rub the areas with retained skin to remove it, but avoid excessive pressure and do not force it to come off. If your pet is too aggressive or fragile for handling, return him to his cage and repeat the procedure daily until all of the retained skin is gone. Dehydration is the root of most poor sheds. Some geckos readily drink from a water dish, while other species must acquire their water by lapping droplets off of plants and cage surfaces. In either case, provide your pet with plenty of clean, fresh water at all times. If your gecko hails from humid habitats, be sure to provide a high humidity in the cage. Maintain high humidity by misting the cage regularly, reducing the cage ventilation or by using a moisture retaining substrate, such as orchid bark, soil or cypress mulch. Even if your pet comes from an arid environment, he will benefit from a damp retreat. Provide one by cutting an entrance hole in the side of a small plastic container filled with damp sand, paper towels or moss. 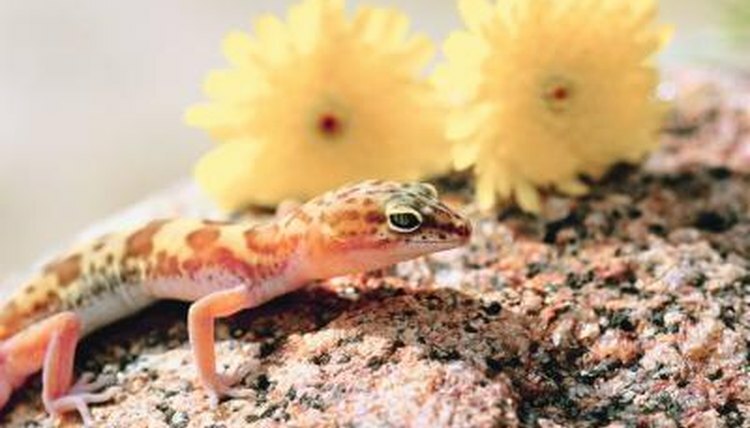 Your gecko may also exhibit shedding problems if he becomes ill or stressed. Always be sure that your gecko has adequate hiding spaces and visual barriers to keep him feeling secure, and visit your veterinarian periodically to ensure he is in good health. External parasites – especially mites – can lead to poor sheds as well as other health problems, so monitor your pet for their presence. Can I Help My Salamander When It Is Shedding? How Can a Lizard Repair an Injured Body Part? Why Do Snakes Like to Sleep in Water? How Long Can Bearded Dragons Be Out of Their Cage?